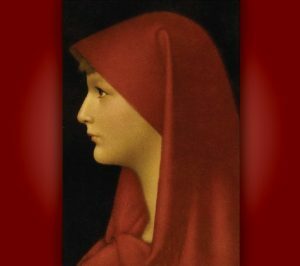 Saint Fabiola is the patron saint of difficult marriages, divorced persons, abused spouses and victims of unfaithful spouses. She was a Christian, born in Rome in the mid-4th century to a powerful and wealthy family. She was married off at a young age to an abusive and adulterous husband. Saint Jerome, the most famous biblical scholar in the history of the Church, knew her personally, as he was her teacher and spiritual director. He wrote: “So terrible were the faults imputed to her former husband that not even a prostitute or a common slave could have put up with them.” Fabiola was able to secure a divorce from her husband under Roman civil law, and then she remarried, violating the ordinances of the Church. While she was still young, Fabiola’s ex-husband died, followed shortly thereafter by her second husband. Upon the latter’s death, she appeared before the gates of Saint John Lateran Basilica, dressed in penitential garb and sought forgiveness for marrying outside the Church. Her public plea for reconciliation was said to have made a great impression upon the Christian population of Rome, and the pope received her formally again into full communion with the Church. In 395 Fabiola made a pilgrimage to Bethlehem, an experience which deepened her faith even more dramatically. She lived in a hospice for a time with a religious community, spent hours in prayer, performed menial tasks and cultivated a profound devotion to the simplicity and poverty of the Nativity. When she returned to Rome, Fabiola sold all her belongings and co-founded what is known to be the first hospital in the Western world. Saint Jerome later wrote that this innovative institution became famous from Britain to Parthia (modern day Iran). And she continued to work tirelessly to treat patients that no one else would treat. Fabiola died on December 27, 399, of natural causes, and her death was marked by an enormous procession befitting a state funeral. Roman citizens turned out by the thousands to express their gratitude for the life and ministry she had embraced in the city of Rome. Her feast day is December 27th.